NOAA: ‘Incredible’ amounts of snow in California’s snowpack | Watts Up With That? Some places have over 600 inches or 50 feet of snow! NOAA’s National Weather Service had this to say about the snow season. Check out the incredible snow amounts across the Sierra Nevada this winter season! Some ski resorts have received about 550 to 600+ inches of snow so far. It’s bittersweet, since this is probably the last big snowpack we’ll ever know, according to 97% of Climate Scientists. I weep for the children. … the last big snowpack we’ll ever know… . I believe it will last us until 2031. 75 climate scientists, also known as 97%. Can you break those numbers down again from the whole flawed survey? I can’t seem to keep it straight in a nice neat little summation. X number of surveys were sent out. Y number of responses came in. Of those Y, Z were rejected, leaving only W, and of those W, only T were treated as qualified “climate scientists”. I’m looking for the concise breakdown for X, Y, Z, and W in my example-format. Thanks, I know it’s boring to go over this again for many, but us slow takers might need the extra reps. I think the numbers are actually irrelevant. What is relevant is that the 97% number was a liberal lie, and for liberals, lies retold often enough become truth. You see this throughout presidential campaigns, Trump investigations, socialist green movements, MSM “News”, etc. ; anything liberal really. Take late term abortion, for example: dissembling (tearing apart in the womb) an unborn baby is not murder, it’s “Planned Parenthood”. Irrelevant? Nah, I want those numbers again to perfectly delineate the lie. Otherwise, when you criticize the lie in general terms, the alarmists will demand the numbers to prove what you say. Okay, here are those numbers again. … is what I would want to say. So, the actual % ranges from 0.54% (READ “zero point five four percent”) to 66%, three of which are based on a ridiculously small number of respondents or papers. Dave, take a look at this interactive graph. Click on “2017” to overlay it. Very useful tool! Only goes back to 1979 though. This is Tahoe Basin, other regions available. I heard the buffet at the Donner resort can get a little hairy, the original Harry et Sally. Do you mock the dead from hurricanes and tornadoes too? Are deaths funny to you? Do you enjoy people being killed by nature? Cannibals don’t discriminate. They would entertain almost anyone for a meal. You on the other hand have no sense of humor. It will cause record floods when it melts, burst dams, cause fish to get wet….all due to Climate Change. Only if it did not snow in the first place….all due to Climate Change. oh I’m just doing what the warmists do whenever they take the last 30 days weather and do a straight line extrapolation out to eternity. Spot on. Could not get any closer to our current “panic in 60 seconds” world. Glaciers? Don’t toy with me, Sport!!!! I would love to see the glaciers piling up again, confounding the yapping climate control freaks. Sara, don‘t be fretting the 2019 “summer melt”, ….. because there is no way that 40 to 50+ feet of snowpack is going to completely melt anytime soon. Unless there is a long duration Pineapple Express due to arrive this coming summer with sufficient rainfall to flush the snow away. And iffen that happens, ……. “Katy bar the door”. Any place that retains snow this year, especially in the west, should benefit from this past winter. But does anyone besides me wonder how much of this snow pack (everywhere) was supposed to go to Siberia instead of us? And the skiing is better at Mammoth. No Sierra Cement. I was going to post the same thing, and Mammoth may still get a bit more snow. This chart is by NWS Sacramento. Mammoth Mountain is in Reno ‘s zone. That total is what they claim for the summit…but if you go to the actual summit it’s still bare rock because of the 100mph+ winds they get there. The only credible total is reported for main lodge which is 426″. This is certainly above average but not an extraordinary number for Mammoth historically. Our children will never know snow. It will only be seen in museum photos … the oh so scientific National Geographic mag. told me. That’s simply not true. If you look into California weather pattern history, we’ve had 5-9 year drought and heavy replenishing weather cycles throughout recorded history. Two years ago climate change activists were predicting perpetual unending drought conditions in California. Now they’re changing their tune since the state is completely drenched. The political redistribution of wealth socialists never change their stripes. They only change their doom and gloom message when the climate doesn’t align with their propaganda. You’re exactly right.Sad because now the greedy developers will build on false expectations of plenty of water.when in fact the trees that were downed helped rain,snow totals and yes the new kinds of replacement trees will take decades to stabilize the environment.At least that’s the plan barring any for scene natural or war castrophic events. It is well known that 97% of scientists believe that “incredible’ amounts of snow are caused by hot weather brought about by Global Warming! They claim that high temperatures over the ocean evaporate bunches of water, which blows over land, forms clouds and recondenses into rain, which magically becomes snow through a hand-waving process in violation of the laws of thermodynamics. The system is not in balance. That dang Man-emitted CO2! Up to its old tricks again! Or could this be just natural variation, that Mother Nature doesn’t know or even care about the Magic Molecule? She’s showing it who’s boss! There’s no such thing as natural variation anymore. Mother Nature has taken a hike. Everything, for good or ill, is now anthropogenic. That’s why we need totalitarianism. Stoopit humans screwed everything up. Look out your window right now. I bet there’s no living thing, no trees or grass, no water, air or sunshine. No stars at night. No birds, no puppies, no frogs; no cockroaches in the cabinets, even if you’re a filthy slob who leaves food scraps lying around. We need all-knowing, all-wise dictators to manage every aspect of our lives from cars to grocery bags to organic cat food — a Nanny State with guns — before anything will ever be right again. And the water content varies quite a bit, from powder to “Sierra cement”. Once the snow settles, the water content per inch on the ground is mostly independent of the density when it fell. While over 600″ has fell at Squaw, only about 20 feet is still on the ground, Some is lost to melt, but a lot is consolidation as the snow is compressed under its own weight. What is a little different this year is that the storms have been colder and there hasn’t been as much of the usual Sierra cement. Just wait till the thaw, the flooding and teeth gnashing start over Climate Change. 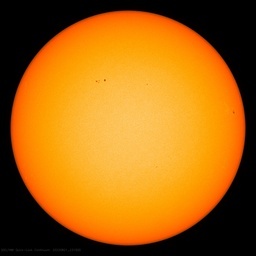 But Climate Cooling is coming.. There will be no big melt ! 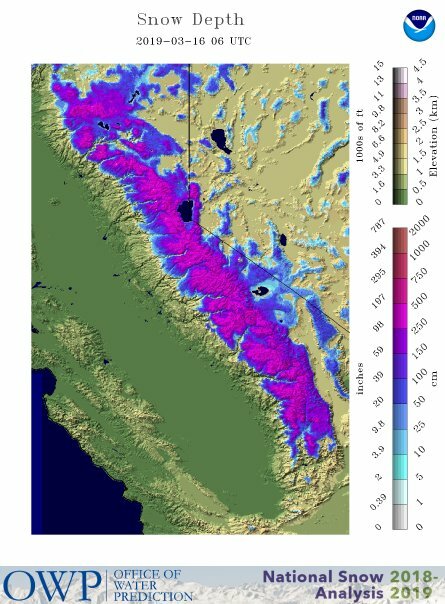 Perhaps Mother Nature decided it is time to grind the Sierra-Nevada range down to size – also known as “take them down a notch” – by building a few nice glaciers. Of course, with these new glaciers in California the sea level will lower! Kinda takes me back to the 70″s right before midwest winters began to kill thousands of people every year buried in snow with folks freezing to death from sub zero temperatures that went on for weeks that ran into months. Western Ski reports were really something to talk about in those good old days before – DA, da, da, daaaa! – the dreaded man made global warming set in. Seems grandpa was right. What goes around comes around. Climate models will show that the precipitation is actually small hail. In a half dozen years it will be shown as a severe drought year for this area. This one is ‘dry snow’, because we should remember, California is in a state of unending drought only to be punctured by flash floods. The climate models said so. I was googling around and noticed the ministry of truth has well hidden the original ‘permanent drought’ news stories. But the ministry was incapable of hiding ‘unending drought’. Are there other juicy comments? These are not exactly scientist backed scares. Though that’s the point. We get memes parroted by alarmists with no real connection to science. By the way, unending drought would stop wildfires. There is nothing to burn without water. If only California had the sense to build some way of storing the water for the dry years. The greens would insist on a major quota for the Delta Smelt, if they ever actually allowed anything to be built in the first place. If you visit the California water resource web site, you will discover the 36 reservoirs are nearly full, amounting to 28,870,000 acre feet of water, Yes its a drop in the bucket, consider trillions of gallons were desposited on the state, but the biggest change was our water table was practically restored. That amounts to billions of acre feet that was restored by percolation of the soils and reservoirs and rivers. https://www.drought.gov/drought/states/california Current drought conditions a first in 7-9 years. Basically drought free. Yes I agree we need to increase our collections, LA county is underway building such systems now. Using country property tax to pay for this effort. All we ask, please let this become a new normal for us! There’s a great spot to build a damn on the Merced River where El Portal Road and Big Oak Flat Road come together. The silly enviros would never let it get built though. The head of CA’s water resources has a degree in…public administration. Is this the new normal? We have so many to pick from it’s hard decide on one. Yes! Emphatically this and everything is the new normal! Like drought in Sahara, fog in Bergen and progressive candidates hoping to beat Trump. Err…now that I got my sarcasm out the way…Anyone know how the snow up in the Alaska is doing compared to the average? I can find depth, but not average. I was wondering is some Alaska glaciers might be growing after this winter. Doesn’t appear to be anything out of the ordinary up there. Your link looks like just some blue text. Search for Snotel Map. Click of the locations of interest if you want specific percentages. Note that the information is for irrigation purposes, so will not be of much help for your purpose, but it appears the Alaska and the Pacific NW snowpack are generally below average this year. There is also the SNOTEL NARRATIVE that lists each state, basins within each state, and two numbers for each basin: the first is cumulative snowpack and the second is moisture for the water year. The numbers are calculated each night in Portland, Oregon from telemetrized data sent from all the Snotel stations across the West! It is too bad that that more smaller catchment dams weren’t built while everything was dry, so more water could be impounded for storage and usage later. A good time to build this infrastructure is while it is in the dry when there was drought. Looks like there will be a real surplus of water this year and a lot of flow out to sea. Droughts usually end sooner or later, so best be ready to capture that when you can. Since water is so valuable in California, seems to me like a real waste and missing a real opportunity to increase water storage availability. Even if that is the water that is utilized to be let go downstream for the fishery, it would save a lot of the other storage later into the drier part of the year. Of course this is part of the water shortage problem, that some of the stored water has to be let go to flow down the river and hence out to sea for fishery requirements. I sometimes wonder why that fishery flow water in the lower, flatter reaches of the rivers couldn’t just be pumping the water in a loop and flowing downstream to the mouth of the river and pumped back up several miles at lower elevations so as less water is actually required to be released from storage? Sure it costs money, but would the value of the conserved water pay for the pumping? What is a fishery worth? I am sure the greens wouldn’t approve of this for infinite reasons anyway, but it should work technically, and even add food and oxygen where required. Create a fishery if you want in the river channel although this plan wouldn’t do anything for the estuary/ocean water. But salmon returning from the sea could just jump into the creek and swim upstream and spawn whereby a whole new school of smolts could rear in the river for a year before swimming back down to the ocean. Rinse and repeat infinitely. Just need a fish ladder at the river/estuary boundary where some fresh water flows through the fish ladder and then no mixing of the fresh creek water to pump back up the river. Good use of that solar surplus every day for 4-5 hours. My thought for the day…dumb idea? Yes, that was the thinking of all of the great system builders in California a century ago, men like Mulholland. They created the infrastructure that California has been living off of ever since – credit their foresight for how long it has been adquate. You have no idea just how much energy, and money, would be required. You’d have to do something like build 2 or 3 5 MW Nuke plants and dedicate their *total* output just to running the pumps needed. Not to mention that each cycle would be amplifying and concentrating all the salts and other contaminants picked up along the way. Yes, salts and pollutants would build up over a half dozen cycles and would have to be let go downstream into the ocean or used for immediate irrigation when reaching threshold limits, but there would be ample additional ponded water if additional storage was constructed. Water temperature would be a factor as well if it had to be beneficial to a fishery in the river reach. I was thinking that some of the additional power supply would come from this new storage with hydro generation that would be used to assist to recirculate the fishery flow water in the loop. The power requirement would of course depend on the flow and the gradient, and would be similar in reverse as if the the small river flow was creating that hydro electricity minus the inefficiencies of generation. If the flow was small enough to sustain a local resident fishery, and the gradient to pump the water back up the river was not too high, then the idea may merit further exploration. Keeping in mind that California farmers pay an average of $70 per acre-foot for water to irrigate crops and that would have to pay all costs for this idea. Perhaps somewhat more if municipal water pricing is factored in, which can be up to $600 per acre foot. You can pump a lot of acre feet if it isn’t a huge lift. And fish don’t need a lot of water to thrive…I worked in a salmon hatchery and we were pumping water from 200 foot wells. Dumb? Not in my opinion but in the opinions of the greens? Horrible idea! Several years ago there was a balloon floated to pull water out of the Columbia River upriver of Portland, OR and ship it via pipeline to California, greens had a fit and a lot of normal people questioned if it was a good plan or not. Tossed out stuff like damaging fish runs, low flows (Portland is actually a sea port even though it’s miles inland and has a lot of goods moving downstream to Portland for shipping), that’s our drinking water, etc.. A change to the idea was proposed to combat most of the questions/objections, don’t pull out any water for California until just before it becomes brackish. Tidal influence will keep water levels up that far down river. That quieted most normal people questions but not the greens, they still had a violent knee jerk reaction. Absolutely no idea works for them unless it involves totally locking an area off to humans except maybe for a “select” few. I was unable to paste the link. Search for Snotel Map. You will get to the NRCS Snotel map. The locations are maintained for agricultural purposes so there are limited locations in Alaska. It appears that Alaska and the Pacific NW are generally below average this year for the current snow pack. Sorry, this was meant for Robert of Texas. Where I work in the Pacific northwest is slightly above average for this date. Most of Oregon is close or slightly above average. That’s what I read, as well. And these “incredible” snow amounts in California seem to be about equal to the annual average snow that the ski resorts in the Pacific NW get. I think Timberline typically gets 500-555 inches of snowfall a year, and up north in Washington, Mt. Baker averages well over 600 inches and often gets in the 750+ range. There are incredible amounts in my back yard, and it”s the middle March. It’s not going anywhere very fast. This morning we had -7 degrees F. And again it’s the middle of March. But, but, but…. I thought, “Soon, kids won’t even know what snow looks like” (2000), and “California is starting a Mega-drought cycle which will last 100 years!!! (2016)… sarc/off..
Not to worry. I’m sure California’s insane enviro-wacko forestry/water policies will maximize large forest fires leading to soil erosion and polluted river runoff, and will squander all the huge water reserves they now have to save the River Smelt at the expense of California’s farmers and residents.. Lot of heat to be absorbed in the phase change from ice to liquid water. Cool spring and summer ahead. This is the first winter in the last 8 years where the Trinity Alps are deep in snow in March. The snow may even last through the summer. I know… nothing to do with weather, climate 🙂 Gore have a hide out there. California needs to get on the bandwagon to inject surplus/runoff water into the aquifers. No need to build dams, no need to build anything but the catchment and injection points. Designating areas for temporary storage is less a problem than dams. The site https://www.nohrsc.noaa.gov/nsa/?region=Sierras was usable for obtaining a March 12 version of the image I cited. What I was able to get was in JPEG format, which messes things up to the extent compression was applied, and the color code scale I found was 2-dimensional, with hue for snow depth and brightness for elevation. Well, the local TV weather person has stopped drilling us with the normal global warming dogma. The Drought Monitor is utter naval gazing rubbish … declaring the CA “drought” over just this week. What utter rubbish. CA recently had a 4-year long drought. It’s been OVER 3-years now. Are there specific locales where precipitation is still not up to “normal” … sure. But that does NOT constitute a “drought” … “drought” … a highly elastic word. We are being LIED to … our children are being LIED to. The disinformation campaign of Climate Change has got to be stopped. Considering there is so much CO2 in the atmosphere, this is likely just a dusting of dry ice. I hear in the Midwest the dams are under threat from all the runoff. Funny, I thought that is what dams were made for. Were they just built to make jobs and impress? Were they not made to handle water? A dam on the Niobrara River in eastern Nebraska has failed, and failed badly. Took out the bridges when it collapsed. I don’t have a link to the video, but it is a stupendous failure. Climate church prophets said snow is a thing of the past and so it is. 2019 will be good wine year. Here in the upper midwest, we seem to be having a “normal” spring, meaning there are no extremes of temperature and we get rain instead of snow. Also, the redwinged blackbirds and grackles returned on time and showed a vague interest in the food I put out, which means that they are getting regular food, such as ground-dwelling bugs, elsewhere. I’m looking forward to a NORMAL summer, whatever that is. But I still have 4 feet of snow piled up in my yard from my neighbor shoveling the sidewalk. All of us still have big piles, but they’ll melt and keep the grass green. And these ecohippies expect people whose brains aren’t fried by hysteria and soy milk to listen to them? I do see a future for them. They will all be living in walled cities, and will have to pay for passes to go outside the walls. Their food will be delivered in remote-controlled trains that enter, unload large pallets, and leave through secret tunnels. Wait – wasn’t that the plot of a series of dystopia novels? Domed cities of Brave New World. Au contraire, walls do work. In THX1138, people lived in an enclosed “city” or habitat and were punished and sometimes executed for going outside. It was “just a movie”, but there is nothing to say it couldn’t happen if it’s allowed to happen. While you’re sorting that out, you’re only a “captive” if you allow it to happen. in Canada, naturally frozen skating is apparently going the way of the dinosaur. The children are gonna be left with wishing they had a river they could skate away on. Bruce here’s a link to a report on 2019…. “longest in years”, well since 2014-15, 71 days, 59 open for skating. Although the commission closed it 10 March, I’m sure they could have reopened if they wanted to as prolonged cold settled in after that. On the other hand at this time of year sun angle becomes increasing problematic for outdoor ice even in fairly cold weather. Is it possible Al Gore bought a retirement home in the Sierra Nevadas – that would be the logical explanation. The more time he spends in a location the more it looks like a winter wonderland. Ya Algore is the Snowmageddon God. I’m really confused. Wasn’t this the same snowpack that was in its death spiral a few years ago and about to disappear? The newly-reconstructed Oroville Dam spillway may get a real workout this spring once that stuff melts. In three days, the cool front will come closer to California. There will be even more snow in the mountains. Most of this years snow and ice will sublimate away by end of May. Or worse case by end of June. it happens that way every year. I started building my Tahoe property in 1979. In 1982 we had an exceptional El Nino with about 12 feet of base at my front door. This year its about 6 to 8 feet of base so not too large but not too small either. snow today gone tomorrow think sublimation. Quick! Build more dams to catch the runoff!